Online review is a big help for me since I’m not very familiar of the terminologies that are being used in Real Estate. It has been my first week with you guys and i find your technique in tutorial very interesting, using [hidden by Admin] … give a big deal of recall. And I learned a lot from the comments of all the members as well. At first, i find it kinda overwhelming (info overload), especially with lots of readings in the Welcome post, but as days passed by, i kind of manage my time when to view the online tutorials and when to review it again. Anyhow, I never regretted being a member of this online review though i must admit that i was a little hesitant to join this site at first..Thank you for imparting all the information and knowledge to us. I hope and pray that there would be more real estate LICENSED brokers soon and that someday “we” could be a big part of the solution to the Philippine’s economy. More power and God Bless us all! UPDATE: Congratulations, Ms Joyce Fabello, for passing the March 27, 2011 Real Estate Brokers’ Licensure Exams conducted by the PRC. On the first day of your Online Review, you don’t have to read all the downloadable PDF files from cover-to-cover right away. Simply skim through them to give you a broad idea of some of the topics (e.g., Philippine laws) that you will need to know more about. Succeeding lessons are delivered every other day (UPDATE: the main lessons are posted daily over a period of 15 days), and you are free to control how many times you will review the material. Just remember, though, that you need to review the material at least twice. There are a LOT of things to cover, and successful learners adopt a long-term approach to the review. [From the Admin] Hi! For more info, please sign up for the RESAR Announcements Mailing List. Thank you. I’m a retired banker (availed of early retirement on 2003 at the age of 34) and doing freelance loans consultancy services to clients. I cater for all types of loans particularly real estate. In line with this, i am planning to get a license as a real estate broker since most of my clients are asking for properties to buy and I always end up looking for potential properties that they can apply for a loan in the bank. So, it’s hitting two birds in one stone. But I guess it would be much proper if I’ll have a license as a real estate broker. By the way, I have a Bachelors’ degree in Accountancy and spent 12 years as a bank professional. I hope to hear from you soon. 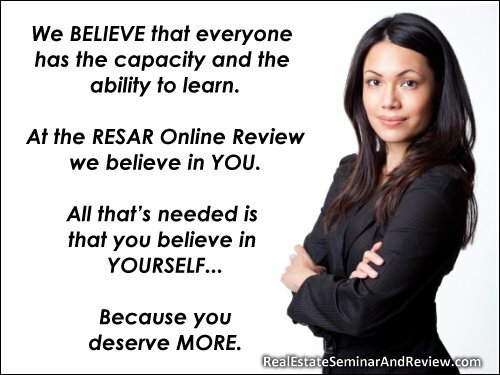 [From RESAR] Yes, you will most likely qualify for a REB Exam, especially after you’ve earned 120 units in real estate subjects. Thanks! Can i take the license broker exam though i didn’t finish my college? I will only apply for the 120 units. [From the Admin] Hello, Roan! Please focus first on graduating. There is a Feb 27, 2012 deadline for filing for your PRC Examination Permit. One of the requirements is proof that you have earned a college degree (which you will most likely earn in March 2012 at the earliest). Also, you will need to earn 120 units in real estate subjects. If you spend time on that in January and February 2012, this might affect your marketing management subjects. We highly recommend that you focus first on graduating. [From the Admin] Hello! We haven’t seen an official announcement from the PRC regarding the schedule of the next Real Estate Brokers’ Licensure Examinations. Please join the RESAR Online Review Announcement List, and we will announce in that list the sked of the exam as soon as we receive an official PRC announcement.